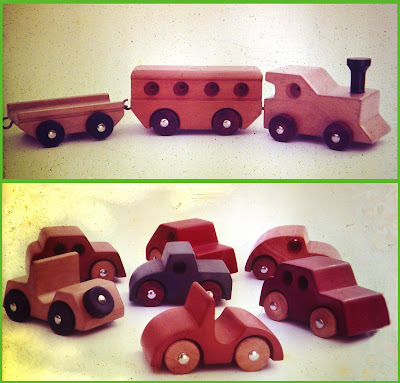 Image: Mini Wheeler series designed for Rockytoys in 1975 using spindle moulder profiles for mass production. The Dinky Toy™ range and the Matchbox™ range were an all time favorite at our shop ever since I first saw the little cars in the late 50’s during our frequent visits to our shop, Rockytoys on General Patters Road. Die cast in zinc with a great attention to detail, each car was a fine replica of the one that the toy represented. Kids and their parents seemed to love these and those who could afford them had large collections and they were used for imaginative play. As little children, my brother and I had a large collection of these Dinky Toy cars, thanks to our fathers liberal position about our access to these toys when we visited the shop, and this extended as well to the Meccano™ construction kits that brought us hours of fun and productive labour in building and dismantling wonderful structures at our home in Guindy in Madras. My father was an avid collector of old toy prototypes and on one of his visits to Calcutta he came back with an enormous set of Hornby™ Model Railway engines, wagons and a huge supply of 0 gauge tracks. It was enormous and we could set up tracks all over our long bedroom at our old house at Guindy and it has stations, level crossing and changing tracks, all made in tinplate construction that was precise and robust in construction. Two clock-work engines and two complete sets of passenger and goods wagons came with the set. He has also obtained a number of catalogues of toy company Tri-ang™, and we spent several hours each day pouring over these books while playing with what we had at hand. 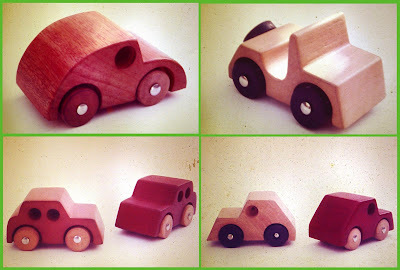 This experience must have been in the back of my mind when I decided to develop a range of little cars for production in our factory using wood as the primary material. I remembered having seen an old book in my fathers collection that showed the creation of the Noah’s Ark and all the animals using a cart-wheel type construction that was then turned on a lathe in the profile of each animal and the animal shape was revealed when the “cart-wheel” was eventually sliced radialy into narrow slices such that the cross section was the shape of the animal concerned. These slices were then whittled and shaped to make a range of realistic animal shapes which could then be included in the Noah’s Ark toy. Each lathe turned “cart-wheel” would produce a large number of identical animals, very clever indeed. 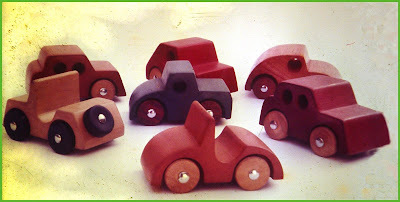 Image: Detail of the BUG, DIX and other three-letter named car toys made using moulded wood profiles in stained wood finish. Inspired by this process I developed a range of spindle-moulded car shapes using a small number of cutter blades since there was little investment funds available to make these cutters. I mixed an d matched the cutters for the front and back of the cars and thereby produced a range that I called the Mini-Wheeler series”, all an extension of the same design strategy that had started with the making of the Big Wheeler and Small Wheeler range, that of using one size of wheel and wheel assembly to produce a range of new offerings. I used a uniform size of drill holes to suggest windows and the form was an extreme simplification but the message was clear. Each car and train set were made using a limited number of cutters and the intention was to offer these in graphic packaging that had large typography and the profile of the car on the outside of the box which was to be printed using the screen printing technique since once again small scale production would be used to establish the product and if they turned successful theses could be scaled up using other manufacturing techniques. These toys never reached large scale production that I had intended but several hundred sets were produced and sold in the late 70’s and early 80’s. The wheels were turned using rosewood stock that had come from a bulk purchase of root segments from a forest auction that my father had participated in during the 60’s and these were ideal for making the wheels since the material was rock hard and the small components were not too difficult to manage from this stock. The body was made using white cedar and another wood called “Manja Kadamba”, which was a local hardwood that was fine grained and white in colour. I used dye colours to shade the finished blocks and no painted version was offered for this range since the stained and natural versions were found acceptable in the market. Image: Mini-Wheeler Train set and the range of cars using the spindle moulding process. Much later when I had returned to NID I developed another toy which was prototyped but never produced which I called the “Acrobats” which was based on the spindle moulded dolls, boy and girl shapes that could be stacked in a variety of ways, being modular in dimension, and these would form a human pyramid when stacked by the child like in the “Janmashtami” function of “Matka Phod” that is very popular in Bombay and all over Maharashtra State. However, design is an investment, and it can be encashed at anytime if the conditions for that particular offering are dusted out from the shelf and offered to the market in an acceptable form and price. These toys can have a life of their own once again and I do hope that some young enthusiast will revive some of these as modern versions and reach these to children who need them for play and learning. Crafts communities in India and elsewhere could use these design offerings and the process of innovation that these represent to kick-start entrepreneurship in their own locations and offer some of these toys to the local markets in a sustainable manner. This form of innovation can be a great driver of the economy but it is still not understood in India for what it truly is. One year after the launch of the National Design Policy in India last February, the Finance Minister today in his 2008 Budget speech made no mention of any special allocation for Design Promotion like Korea has done or Design Support like the Wales model both much needed in India today, just as in the last year the only mention about design was at the tail end of his speech when the service tax on design services was announced for the first time in Parliament. I wonder when design, as we understand it today, will be recognized in India for what it can really do in the core areas of our economy and society and not just for the superficial qualities that are those dealing with the aesthetic quality of products, which is perhaps well understood, but unfortunately these are equated to luxury products and services and not for the core applications across 230 sectors of our economy as I have been arguing here on this blog. Image 01: Big Wheeler Jeep that was an instant success with both schools and homes. After the instant success of the Big Wheeler series I got to look at the full range of educational toys that addressed the school market in South India. March and April were the period for the annual pilgrimage that school teachers from a great number of schools came to our retail shop as well as our factory to select items for their annual procurement programme. Some came with big budgets and in their school bus and after an afternoon of selection and billing took back the items that were in ready stock on their bus and thereby saved on packing transportation costs. Others came with long wish lists and placed orders that would be passed on to the factory for implementation. March to May of 1975 was as exciting as it comes since we had so many new items and a whole fresh new colour scheme that surprised the teachers who were veterans when it came to visiting our shop, since the quality had improved substantially and so had the prices, but they did not seem to mind at all. One lesson from this experience is that customers know when they are getting a good deal and they then do not mind paying a premium for quality. 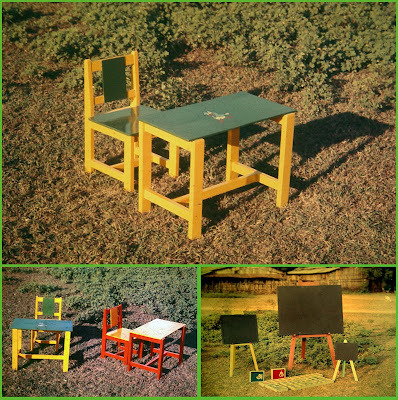 Image 02: Educational items, Child’s Furniture and Classroom accessories. In anticipation of the deluge of visitors from the schools we had already geared up our production with a special focus on the needs of the sector and the stocks in our shop and godown at the back were substantial. The range of products that had a new look included the rocking horses and the school furniture range for the primary school level. I had simplified the form and structure of the child’s chair and table as part of one large order from a local school in Madras. The first batch of 100 sets were made in the existing design while I had a grandstand view while observing the various stages of production which lasted all of one month. When the next school order for 400 sets came in soon thereafter I decided to redesign the table and chair by rationalizing the members and in simplifying the shape of the components so that these could be made easily using the machines and in the process I eliminated the complex shaping of the chair which used to be done by making the back legs by cutting these to shape on a jig-saw cutter. The shape of the seat was further changed from a trapezoidal one to a square with rounded corners and these two design decisions saved a huge amount in labour and the order was completed in record time while providing a better finish and structural quality. These new design offerings had the same effect as the changes effected in the wheeled toy range. There was a dramatic improvement in quality as well as a very strong growth in price perception although there were very good savings in the cost of labour and production. These new tables and chairs were in continuous production for many years till our factory was finally closed down in the mid 90’s. Another product for the school market got a boost just by rationalizing the marketing module and by offering an existing product in smaller sized packaging, something that the MNC’s are trying to do to reach the “Bottom of the Pyramid” market in India particularly in the cosmetics and FMCG products. 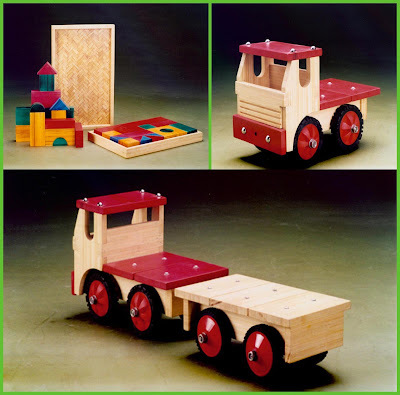 The product in question here was a great set of building blocks that was primarily intended for the school market and it was offered in a huge set of several hundred pieces containing many modular sized painted blocks, all packed into a big strong play box made of wood. This was also offered in an unpainted version but few schools showed interest in these although in my view these were superior in finish and quality. When I studied the sales data for these building block sets I found that an average of six to ten sets were sold each year to the school market since the whole set was quite expensive and would represent a large part of any schools annual budget. I designed a built a range of boxes that could hold a limited number of blocks and I selected these blocks based on the possibilities that each set offered a child to make meaningful structural configurations. For instance even the smallest set had two diagonally cut squares which could be used to make the sloping roofs and one arch shaped block so that the child’s imagination could convert these into semantic structures that would bring in the fantasy that play with these blocks entailed. Besides providing the child with manual dexterity while arranging and balancing the blocks one on top of the other it also supported imaginative play with flexibility and helped creative exploration just as the Lego blocks now provide our kids at home. However these large sized blocks could be used to build child scale houses in team play and this was an advantage that the school teachers saw and cherished. My new offering in small sets suddenly made the blocks attractive and affordable for the home market as well and by the end of the year an equivalent of a hundred large sets was sold to both the school and the home market, once again showing that design works at many levels, if only we tried. Image 04: Educational kits and Classroom accessories for schools. During this period I started participating in conferences and meetings organized by the toy industry as well as by voluntary groups of educators and industry members and this was a great source of learning and exposure about the changing ideas in education at the primary and pre-school levels. I met some very interesting people who were committed to the idea of education and the role that teaching aids played in this process. This exposure also led me to innovate my own offerings and many new items were introduced in our own list of offerings that drew on the learning from these interactions in the field. 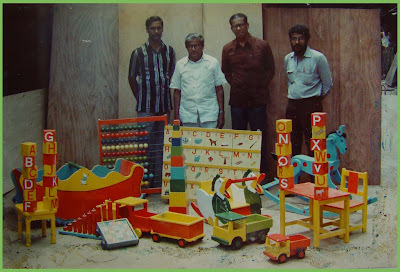 Image 01: A Systems Collection of Big and Small Wheeler Toys that I designed in 1974 for my father's factory in Madras. When I got back to Madras in May 1974 after five years at NID I found that my father had reinvented his business to have a lower dependence on the wooden toy section and a greater share of his turnover (and margins) coming from the flush doors and furniture manufacturing business. I had returned to my home and our factory after having completed my PG Course in Furniture Design at NID (1969 – 1972) and having served on the Faculty there for two years (1972 -1974) during which time I had a fair amount of experience in both teaching and in professional projects through the NID’s Design Office. The wooden toy section was much depleted in number of workers and many items were being made solely for the retail shop in the city and some still popular items were being made in larger numbers for the school market as well as for supply to trade dealers across the South. I was in a pretty depressed state when I got back home since my departure from NID was not of my choice and I had hung around in Ahmedabad for a couple of months till my money had run out and I was compelled to return to Madras as a confused young man. I did hang around the factory to try and capture the earlier enthusiasm but now no one there would listen to the new fangled ideas that this young designer had and offered through which he promised he would help change the face of the industry. No one had heard about design and the message was lost in the din of the machines and the need to complete the pending orders on hand. After a couple of months of trying I decided to try my luck elsewhere and started hanging out with a school friend who now worked as an accounts manager in a local advertising agency and spent a good deal of time in tea stalls, restaurants, cinemas and in the bus or train while commuting from home to city and back. I was however given the responsibility of reaching our shop in the evening and returning home with the sales proceeds of the day after closing the accounts and tallying all the bills, very boring indeed, but great education in business discipline. Late in the evenings and far into the night, I started sketching and building concepts of how the toy section could be revitalized at our factory. I had access to data of sales records for the past few years from the retail shop and also the costing data from the factory about each of the items that I thought could be redesigned or improved. The advertising agency however started giving me contract tasks to design logo’s, brochures and then an exhibition for some of their clients in the pharmaceutical and surgical instruments industry which helped start a fairly healthy cash flow and I worked out of my bedroom at night while continuing my lazy and serendipitous wanderings through the city by day. I read many books and visited bookstores and libraries regularly, which was the most visible activity as far as my family was concerned. My father, M V Gopalan, was indeed quite concerned at the state of his “unemployed” vagabond son – who sported a black beard and argued at the drop of a hat – since he did not know much about my activities during the day or late at night when the midnight lamp stayed lit in my room while I read or sketched, according to my mood. Image 02: Big Wheeler Jeep Toy and Full Body Truck made up of modular components that are interchangable to facilitate inventory control in production. We had a heart to heart talk some three months into my enforced stay at Madras and he offered to let me build some prototypes of my new sketches for toys, not because he had changed his business strategy to expand the toy activity which was then being cross subsidized by the furniture and doors business, but to get me back to what he could relate to as productive work. I had chosen to first work on the wheeled toy range since the factory had a list of almost 40 different wheeled wooden toys on offer and they were quite popular with the boys who visited our shop and the school buyers in particular always had a few on their purchase wish list. However when I looked at the production data I found that each of these had evolved at different times without any effort to coordinate the components and there were bins and bins of different size wheels stuffed into large metal drums that were used to store the components near the wood turning centre in the factory. When the turners ran out of work more wheels were made and stuffed into more drums, the right hand did not know what the left was doing. The same was true of the other components that were made on the jig-saw and the cross-cut saw centre, each managed and operated by a specialist craftsman who had to be kept busy by the factory manager. 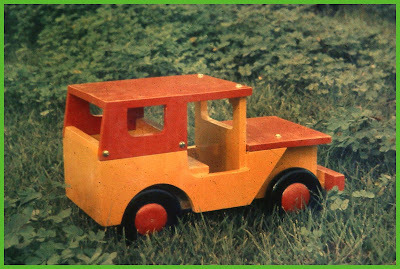 The documentation for these toys was in the form of plywood templates, sets of which were hung with a metal wire from the roof in the toy assembly section near the paint shop. These templates were dusted and brought down each time a new batch of toys were to be made and the quantities were decided by the manager, usually in divisions or multiples of dozens, depending on past performance in the market. 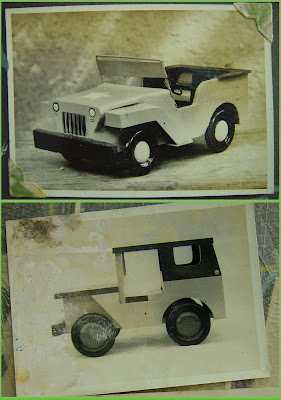 Image 03: Existing Big Jeep made of 25 pieces of wood, plywood and metal parts and the new design Jeep Toy in simplified construction and better finish from the factory album of 1974. I started with the existing Jeep car, my favorite as a child, which was offered in two sizes, big and small. Each Jeep was made up from over 25 pieces of wood and plywood pieces that were cut according to the template and then assembled with glue and nails before being painted and decorated with lines and trims. The quality of construction and finish were fairly crude and the pricing was unsustainably low. However, I found that barely 10 pieces were sold in the previous year; hence it was not a significant loss. The sale price of the big Jeep toy was Rs 17.50 in 1974 and according to my calculation the cost of production was Rs. 25 at least. I decided that my design strategy would be to reduce complexity of assembly, rationalize wheels across a number of toys, use the machine cut precision to improve quality and use spray painted components to make quality improvement in finish and avoid multiple colours and lines on a single component to de-skill the finishing stage and the use of a metal bush bearing for the wheel assembly to make the product durable for rough play as the existing one had weak wheels that made the product less attractive and to avoid nails for the assembly of components. These strategies came out of my conviction from having played with these toys as well as from information about user complaints particularly from schools about the wheels, which is the key functional component in this toy. My new Jeep toy was made of 15 pieces of solid wood planks, no plywood was used since it tended to fray in use, and the whole assembly was spray painted before assembly to get a great finish and precise joints lines. The breakthrough in the wheels assembly came from our doors business since the bearings were made of the redundant aluminum extrusion sections from tower bolts that were left over items when the flush doors were supplied with the upper stopper removed for use with holes drilled in the door frame. This was available in plenty and could be purchased by weight and therefore cost effective as well. A matching metal shaft was used and these were anchored firmly into the wooden wheels through squared ends that were forged by heating on a hot coal fire before being used for the wheel assembly. The extruded bush bearing had pre drilled holes for receiving screws top be mounted on the chassis that was a long wooden plate that extended from the front to the back of the vehicle. All wooden components were made of uniform thickness and these are cut in modular sizes affording reuse in other vehicle types in the series thereby reducing component level variety. The cost of the finished Jeep with a canopy that could be sat on by a child was Rs. 20 and we priced the toy at Rs 45 for retail. The other products in this range were the three types of Trucks – Platform, Half-body and Full-body – each priced at Rs 35, Rs. 45 and Rs. 60 respectively. Image 04: Small Wheeler Truck System seen in the three colour schemes that I standardised for the range of toys. The range was offered in three colour variants of Orange-Red, Yellow-Green and Blue-Green combinations all standardized to the available enamel paint range of a reputed brand so that the earlier lack of colour standards could be avoided during manufacture. All these steps ensured that the quality of the end product was sharply better and the market lapped up these products that day the first batch was taken to the shop for sale. It made a record that day. It was an amazing experience for me to be at the Rockytoys shop when my mother and I started arranging the show window and sales of the product started immediately. They literally flew off the shelf and the first batch of 12 Jeeps and 18 Trucks were sold out on day one at unheard of prices, and this represented over two years sales of the existing range. Design had made a huge difference at this small-scale industry and this market success continued for many years thereafter. 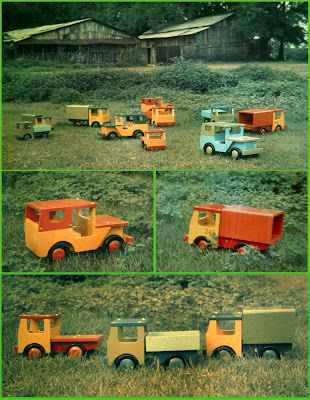 Several hundred toy Jeeps and Trucks rolled out of the factory and the shop and I remember when it was launched at Bangalore, the toyshop on Brigade Road had stacked up their shop window with this range during the Christmas season in 1975. For me it was a truly wonderful sight to see my products on sale in Bangalore as well as to get positive feedback from schools such as The School in Madras who had used my products. I wonder if some of the kids who had then played with my toys will get in touch through the new connectivity provided by the web, only time will tell. Image 05: Range of new colour schemes applied to existing toys and this was extended top all products made by the factory. My status at the factory changed dramatically overnight and the shop floor workers and managers looked at me with a new interest but could not yet understand how this drama actually worked. Design was like some magic, and the designer, the wielder of the magic wand was much respected and consulted for all kinds of problems and many products could be changed in quick succession and several opportunities were explored in the two years that I spent at Madras before I finally returned to NID and rejoined the Faculty in June of 1976. I will share some of these experiences as well as the insights about design and its use for small industry in the days ahead. Design is a very gratifying occupation and I do wish more young people in India would enter this profession and that many more industries would use the discipline to help build quality products, particularly in the small-scale sector. My father no longer had his earlier concerns about me but he agreed with me when time came for me to return to NID as a faculty member at a fraction of the salary that I had been earning at Madras from my freelance design consultant work as well as from my contract work at the advertising agency that continued alongside my work for my father’s factory, which was by the way unpaid labour, if I do not count the food and lodging that I had from my home, and the access to the free telephone which was critical for my design business in those days. Image: My father, M V Gopalan is standing in the middle dressed in white as always and my brother M P Manohar is the one on the right sporting a beard standing with colleagues at the factory with some of the wooden toys on display. This picture was taken sometime in the early 80's when I had returned to NID as a faculty. Having written about the Lego story in my last post below, I felt that it would be appropriate to continue the toy-story thread with some reflections on my own life and my personal interface with toys and toy making. By the way, I was born in 1950 on the 9th November and on that same eventful day, according to Rene Spitz in his book “hfg ulm: The View behind the Foreground”, the Ulm School of Design got its name, a significant moment for design, the naming of the great school in Germany, not my birth. I was born in the humble house of a carpenter, nay a young engineering teacher turned carpenter-entrepreneur by choice and I am told on that same day the house and the factory attached to our house got connected to the electric power grid for the first time. It was also an auspicious day for all Hindus’ since Deepavali (Diwali – the festival of lights) happened to fall on that day in that particular year, which was the 9th of November 1950, I am told. My full name is M P Ranjan, where Ranjan is my first name and "M P" stands for my family name when expanded, but this is never used except on my passport document. "M P" stands for Mundon Pandan. My students call me "Ranjan", my first name and in most formal situations I am Prof. Ranjan or Mr. M P Ranjan. This is a very personal story. By the way, the toy factory was called "Modern Agencies" and was set up by my father, M V Gopalan, in 1942 in Madras in South India (now called Chennai) with a capital investment of Rs 350/- after he chose to “retire” young from his engineering college teaching job to become an micro-scale entrepreneur. I have not written about my toy experiences much before but I think that it is now time to add this dimension to my website and the blog. 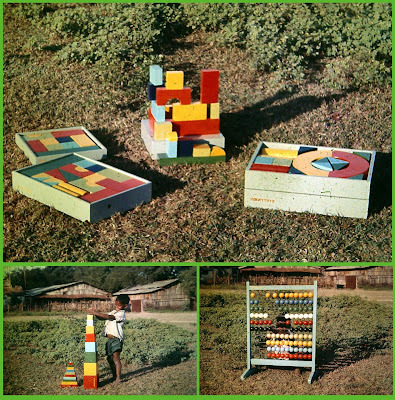 The toy factory made wooden toys and playground equipment and included toys for home use as well as many educational products and furniture for the local school markets, over 400 products were on the price list and as the factory grew it became the biggest toy company in South India with supplies going to all major cities of South India by 1964. At this time it employed over 400 full time workers and many others on contract labour who worked from their home and this community may have numbered over 1000 individuals who worked from home to carry out these contract tasks. The product line included papier mache dancing dolls, wooden toys, educational aids, school furniture, office and domestic furniture as well as flush doors and specialized industrial wooden products of many descriptions. Image: M P Ranjan as a child and one of my favorite toys that was made in my father's factory and one that I got to redesign in 1974 when I returned from NID. The product range, which started with Rocking Horses, in wood, were the most popular product line in the fifties and the early sixties, The other items included school counting frames using wooden beads, outsourced from the town of Channapatna in Karnataka State. The next most popular item that I remember is the Papier Mache Dancing Dolls that sold in the hundreds of thousands at local exhibitions and they literally flew off the shelf and these were all made by the contract craftsmen families living in the city of Madras, near Saidapet, Velecheri (near our factory located in Guindy) and some as far away as Royapettah and Perembur across the city and quite far away to the North of the city. My father was quite proud of the fact that he had managed to provide stable employment for so many people when getting an honest days wage was an uphill task in most Indian cities. In the late fifties he had set up a toy retail shop under the brand name of "Rockytoys" after the popular rocking horses that he had innovated and produced from 1942 onwards. He had designed his own jig-saw "machine" in 1942 that used a bullock-cart wheel that was used to power the cutting machine, which was operated by a person who turned the fly-wheel using a hand-crank, and a stout rope then transferred this power through a system of pulleys to work the simple “machine”. He developed a similar sand-papering machine and with these two creations set about the making of his single product, in those days, the hugely popular wooden rocking horse. 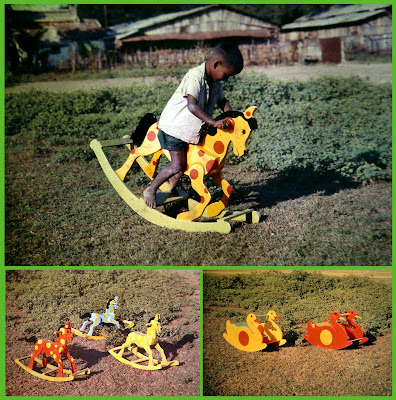 The rocking horses that were made in the early days were sold in the city of Madras directly by my father who used to take the finished product on the back of bicycles and later in larger numbers on hand carts when the production and sale grew in response to demand and these were first sold directly off the streets and later in stores that kept regular stocks as the market expanded for these products. Image: The old and new jeep toy as seen in the old Rockytoys photo album in my mother's house. The new jeep was a redesign done by me in 1974 and I will detail the design strategy and more about it in my next post. From these humble beginnings his factory grew and prospered and the product range was diversified further into furniture and school equipment. Many new machines came in and the production then included the making of wooden components for railway coaches for the fledgling coach factory in Avadi, Madras and the manufacture of plywood flush doors using a new lamination technology that he learned from an Italian engineer, Bottichelli (pronounced Butty Jelley in those days). With the help of his expertise the company took up the fascinating task of building 14 plywood houses for the faculty and an auditorium for the experimental dance school of Rukmini Devi Arundale at the Kalakshetra Foundation in Madras. I was fortunate to watch these developments at close quarters as a child and to visit the construction sites with a sense of wonder at all this adventure in small-scale manufacture and entrepreneurship. This is a long story of entrepreneurship that has been repeated many times in India and it is a true rag to riches story that I will try to tell later in some detail when time permits. I did not know it then, but it was design and innovation that was the driver for my fathers efforts and when I look back I realize how fortunate I was to experience these events and I wish that many more of our young students in India would have such exposure which their schools just cannot or do not provide today. From the perspective of my real world education the story gets interesting here, In 1964 to 1967 my father’s factory and his network of suppliers faced their first major labour unrest. The city of Madras and the whole of South India discovered Red flags and Communism in a big way and due to the associated trade union action and the factory was closed down for over a year and then in smaller sessions due to the labour strikes and follow-up court action. Needless to say my father lost all his money. I was 14 years old then and old enough to understand first-hand what he was going through in his moment of crisis. Some production however continued through the network of outsourced contract labour and his business survived (another long story waiting to be told) and as a result I decided in 1968 not to join either the local Engineering College or the School of Architecture, where I had obtained admission after completing my one year Pre-University course from the prestigious Madras Christian College at Tambaram. My childhood education was the best that money could buy in Madras in those days. I went to Church Park, Presentation Convent at Thousand Lights in Madras for my junior nursery to fifth standard classes (seven years of Convent education by Irish Nuns - my language competence came from here, I am sure) and then to high school at the Madras Christian College High School as Chetput in Madras where I did engineering as my major subject. However, I now realise that I had lived a double life, one with great schooling and academic rigor and the second with a terrific grounding in real world skills at our factory and our business on toy design and manufacture and marketing. In 1969 I applied to NID’s Post Graduate programme in Furniture Design as an "Experienced Cabinet Maker" after working full time with my father in his business for one year, although I had been involved in his business already from 1964, if I look back and my childhood experiences. 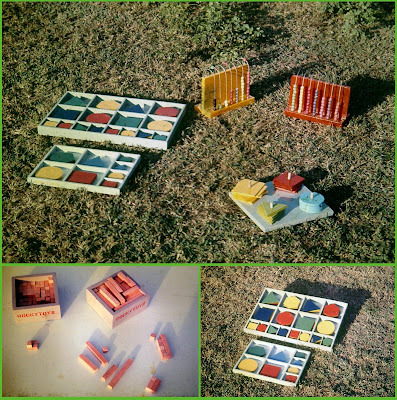 Image: A collection of toys made during the "Bamboo Boards and Beyond" project at NID in 2000 as part of the range that I designed based on my Rockytoys experience. At NID most of the products that I designed as a student were for children, I made a stackable fibreglass chair and table and prototyped it in 1970, a Tier-bed for children in metal tubes and wood which was knockdown and many toy ideas that were sketched and built as concept models. In 1972 I was inducted on to the faculty at NID and I decided to follow my growing interest in research and education and my disillusion with Indian business climate as a whole from my early experiences in the field. I hit a road-block in 1974 when I was asked to leave NID abruptly, in my view unfairly, but I had no option but to go back to Madras while I continued to argue my case with the then NID management for redress. At Madras, I realised later, that this was a blessing in disguise, a trial by fire if you will, and I set up my own design practice from my bedroom and using my fathers phone, I took on all sorts of design assignments on the basis of my very broad education and exposure at NID, interiors, Graphic print brochures and symbol design for a local advertising agency and exhibition design which resulted in a very healthy cash flow, far in excess of my NID salary. In the nights I worked on design of a new range of wooden toys for my fathers factory to pay back for the lunches, dinners and for the roof over my head. In two years at Madras I had designed more that a hundred new toys (some redesigned or with new colour-schemes) and this transformed the profit profile of our company and our sales from the Rockytoys Showroom sky-rocketed in those days, thanks to the design inputs which became visible and appreciated due to the real demonstration that was taking place. But I was however restless and continued to follow up the NID dream. I was finally re-inducted at NID on the faculty in 1976 and among the first project that I took up independently was the Chennapatna Toys collection for the crafts community there with sponsorship from the All India Handicrafts Board (now called the Development Commissioner of Handicrafts, Government of India). The toys that I designed then are still in production at many centres across India since they are made using wood turning and are easy to make and sell with very little capital to start a new company. In the bamboo range we have designed many toys and children’s furniture, which are now being promoted as poverty busters that can help Rural India survive the globalisation pressures. I now realize that I had intuitively embedded certain qualities into the products that could support start-up entrepreneurship and this is perhaps the reason why these products are made and produced at so many locations around India by small producers who like my farther have tried to find their feet and survive in a situation of poverty and absence of capital. My brother, M P Manohar took over our factory and businesses after my father passed away in 1988, since he was already helping him for many years in the business at Madras. 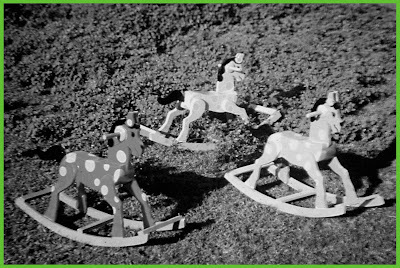 However the manufacture of wooden toys was coming under serious competition from plastics and the labour situation was not easy either nor did our family have the capital to grow the factory to the next level of sustainability with the introduction of automation and new quality standards that markets demanded and it was therefore closed down and eventually sold out in the mid 90’s. My brother continues to live and work in Madras (Chennai) and is now with the Dakshin Chitra Foundation to help build a Toy Museum at the Foundation's exhibition site outside Chennai. My brother too had studied with me through all the schools, just one year behind me in a junior class, and then he too joined NID as a student of Graphic design in 1973 although he too was a skilled craftsman having made over 100 or so Aero models, ships and many many other things together through our very rich childhood experiences together, including plastic scale models of architectural projects and buildings which my father had started as a side business to the toy factory. Life was tough but we can now look back and cherish the finer points of the rich experience, no regrets whatsoever. My mother too had joined the family business when the going got very tough in 1964 and stayed on with the shop in the city till my father passed away in 1988. She now lives in Bangalore in her own home near that of my sister (M P Meera - Meera Nandanan) who also lives there, having moved back from Kolkatta to Madras and then to Bangalore after our business was closed down in the mid 90's. She too contributed and managed the Rockytoys showroom during her stay at Madras from the early 80's. So in all it was a true family saga that needs to be told in some detail, hopefully sometime soon, with pictures. This is a short version of our Toy story and I think that it is now time to blog my experience on toys and to share my experiences. By the way, since I got passionately involved in each of my activities as they unfolded I used to be called "Dr.Toy" by my friends and acquaintances in the early 80's before I moved on to acquire new skills to become "Dr. Geometry" and "Dr.Computers" "Dr. Publications" and now-a-days "Dr. Bamboo" and "Dr. Design Theory"....... By the way, I have never completed any degree qualification in my entire career but I have managed to attract these taunts, nevertheless.